Madeleine Peyroux at the Berklee Performance Center Sunday night. Though blessed with an exquisitely pliable alto, Madeleine Peyroux has always been too reserved and retro for the diverse adult-contemporary market that embraced Norah Jones and Adele. Instead, this former teen busker has unwound her jazz-pop career over 20 years like Billie Holiday once unwound her vocals, hanging languidly behind the times like her biggest influence hung behind the beat. Their restraint befitted the refined performance by Peyroux, upright bassist Barak Mori, and electric guitarist Jon Herington. Even when all three were singing and playing together — Peyroux on acoustic guitar or six-string ukulele — fans could hear her swivel chair creak and birds chirp in the rafters. 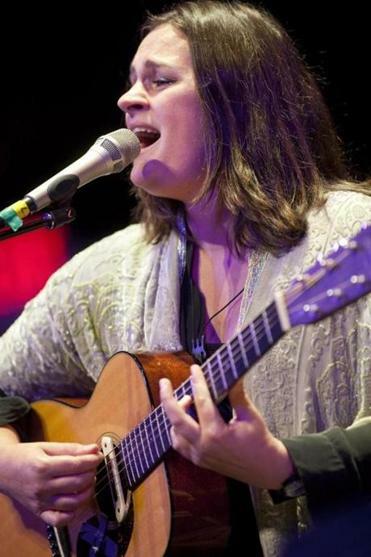 At her best, Peyroux often grounded her performance’s gossamer grace with terrestrial tethers like that, whether it was the foreboding in Elliot Smith’s “Between the Bars,” the saunter in a handful of blues, or the bossa nova sultriness in Antonio Carlos Jobim’s “Agua de Beber,” which drew the night’s biggest applause. To close, however, Peyroux chose a ballad recorded by Holiday in 1950, “This Is Heaven to Me,” letting its slow lines drift up and away, a gift to the nestlings.